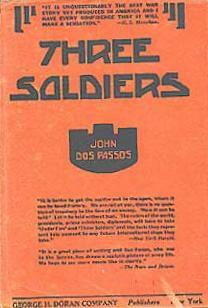 Three Soldiers is one of two early novels that John Dos Passos (Chicago 1896 - Baltimore, 1970) wrote about his experience in the First World War. Precisely it is the second one, since the first is One Man's Initiation (1917). 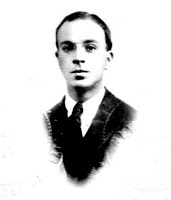 Three Soldiers was published in 1921 in New York by Doran (below is the cover of the first edition). The book tells the stories of three American soldiers while they train and prepare to travel to one of the main fronts of the "European" War, namely the French one. The three are Fuselli, an Italian American coming from San Francisco, Chrisfield, a farmer from Indiana and the talented Andrews, who studied at Harvard and that can be considered under many aspects as the author's alter ego. The three represent a significant "sampling" of the white America back at the time the country was facing the global conflict originated in the heart of Europe. In Three Soldiers different imaginaries clash in the sprockets of military life, in the bureaucracy, in the boredom and finally in the lies and in the carnage of war. The narrative device of Dos Passos aims to show the dehumanizing effects of war on the fear, on the instinct of rebellion and on the individuality of each of the protagonists, who move in a kind of triangulation and therefore give life to a "triple novel" in one.